Own a unique and beautiful piece of nomadic heritage with our Mongolian gers! All proceeds support FIRE’s work in Mongolia. A portion of each sale purchase price is tax deductible. The traditional Mongolian ger is a handmade, felt-covered, wooden frame structure used by nomadic cultures in Mongolia and other parts of Central Asia. The ger is known as a “yurt” in Turkic languages. Gers are excellent for a wide variety of purposes. It can be used as a primary house, guest room, office, yoga space, or anything else you can imagine! *$1,000 from the cost of each ger is tax deductible. A tax-deductible receipt will be mailed to you after the gers are delivered. What is a ger? What is it made of? The Mongolian ger has two key components: the wooden frame and the felt and covers. A ger is essentially a sturdy, portable well-insulated felt tent. Gers are designed to be easily dismantled and moved on the backs of camels and yaks. Mongolians will move their camp 4-10 times a year! Mongolians can break down and set back up their entire home in a few hours. All of the wood parts are made from locally sourced and renewable larch, birch or pine woods. The door, roof poles, and roof crown are hand-painted with beautiful traditional Mongolian design using lead-free paint. The rope is made from yak hair. The lattice walls are tied together with camel sinew. 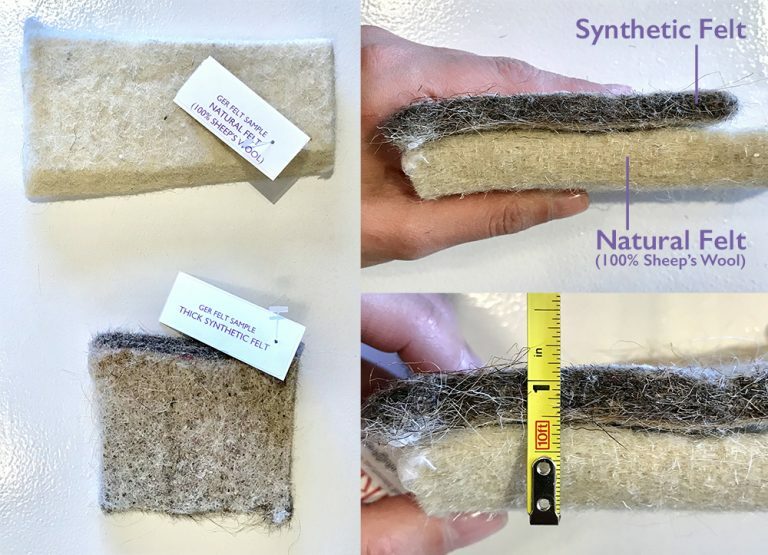 The felt is all natural sheep wool that has been cleaned and processed in factory. Factory processing makes the felt an even thickness, very clean, with no sheep smell — therefore more bug resistant. Each ger is a unique hand-made cultural item. 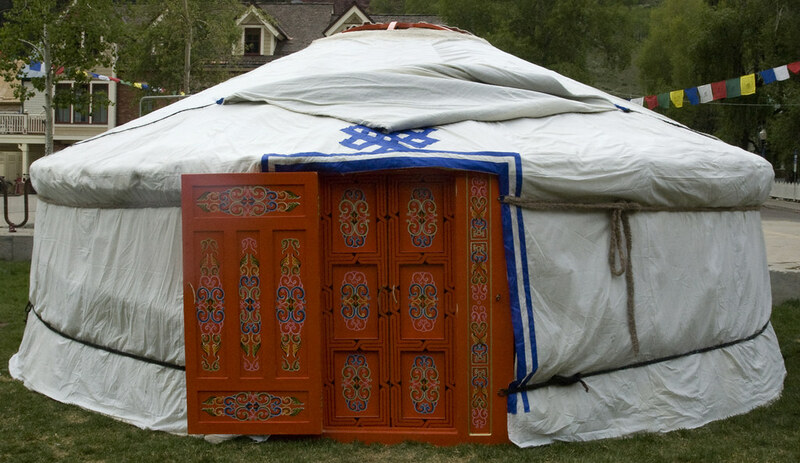 Traditional Mongolian gers differ from the more modern Western yurts. 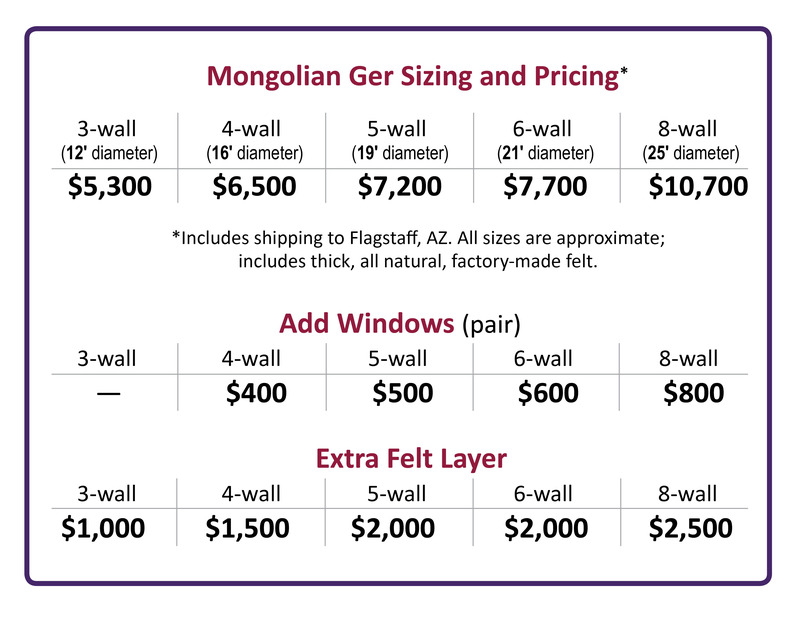 Our Mongolian gers do not have windows, although large windows can be purchased at as an upgrade (pictured). In Mongolian gers, the roof slopes lower at the interior walls (you cannot fully stand at the edges of the walls). The source of light is the open door and the roof crown (you can finish the roof crown with glass or plastic for a more permanent setup). However, its stout frame is extremely sturdy with its center roof crown supports. These gers are made for the a harsh climate and can withstand wind, temporary snowpack (remove snowpack daily), and stay incredibly warm inside — you can even install a wood-burning stove inside with the pipe exiting the roof crown. We ship containers from Mongolia on a revolving basis. Check our website for our next order date. If you are willing to pay extra for shipping, you can order your ger and have it shipped to you anytime. See Additional Shipping Options below. Please call us at 928-779-2288 or send us an email to learn more about owning your very own unique piece of nomadic heritage! We look forward to speaking with you! When will I receive my ger? We place orders with Mongolia on a revolving basis. Check our website for our next order date. All gers are presold with full payment made prior to construction. We ship containers from Mongolia to Flagstaff, AZ. The price includes all shipping to Flagstaff. Once an order is placed, it will take 3-4 months for your ger to arrive in the United States. The gers are made to order. They take a few weeks to make in Mongolia. From Mongolia, the container goes by train to Shanghai, China and then onto a ship that travels to Long Beach, CA. From California, the container comes to Flagstaff, AZ by truck. In Flagstaff, it is held for pick up or shipped on to its final destination based on arrangements you may have made. Each step of the process can vary in its length of time. The paint on the ger dries slower in the cold winter months. Holidays in Mongolia and China can vary the time between production completion and being put on the ship. There is only way into China from Mongolia by train. The process can get backed up at the China border. As well, a ship traveling around the world is not on a fixed schedule. We will keep in close contact with you through the process and update you at every step of the way. If you don’t live in Flagstaff or even the United States, we can still get the ger to you for an extra charge. Please see the “Additional Shipping Options” section for more information. If you live within driving distance of Flagstaff, we can hold the ger for you for up to seven days from the day of delivery for no charge. We can hold it for extra days for an additional $25 per day. A 5-wall ger weighs about 1200 pounds and will fit in a well packed, full-size truck with a cab. Shipping to Flagstaff, Arizona by sea container and truck is included in the cost of the ger. This includes all import fees and taxes. We can hold a ger in Flagstaff for pick up for seven days from the day of delivery. Each day over seven is a fee of $25 per day. To pick up a ger, you would need at least a full size pick up truck, depending on the size ger you choose. Having a rack and/or extended cab is helpful. A 5-wall ger weighs about 1,200 pounds. If you still want the most cost-effective shipping option but do not live close enough to Flagstaff to pick up your ger, we can send it to you from Flagstaff by truck. The cost for this varies from $0.75 per mile depending on your location and the number of gers we are delivering to you. Contact us today for more information and detailed pricing. Shipping outside the continental United States or need it fast? We ship by air. Gers can be shipped anywhere by air freight including Alaska, Hawaii, and Europe. Do you need it sooner than the 3-4 months shipping time by sea? We can also ship by air to anywhere in the United States. Please see below for the additional shipping cost for this delivery option. To LA, NYC, Miamai, DC, San Francisco, Atlanta — $2,500 + land transportation. To Germany – $2,000 + land transportation and import fees and taxes. To Hawaii – $2,000 + land transportation and import fees and taxes. All locations are available for air shipping. Contact us today if you do not see your preferred location. Because it is a smaller shipping space the crown/roof of the ger comes in two parts that are screwed together. The above costs are for shipping from Mongolia to the country’s port of entry only. The customer is responsible for all other expenses including customs fees and related expenses including duties, taxes and/or VAT required for customs clearance. It will also be the customer’s responsibility to work with a local freight forwarding broker and to make arrangements for pick-up at the airport or for further transportation within the country to your final location. If you are shipping by air to the United States, we can help you with the local broker arrangements.